The FDIC often hears from bank customers who believe they may be the victims of financial fraud or theft. To help further, FDIC Consumer News includes crime prevention tips in practically every issue. 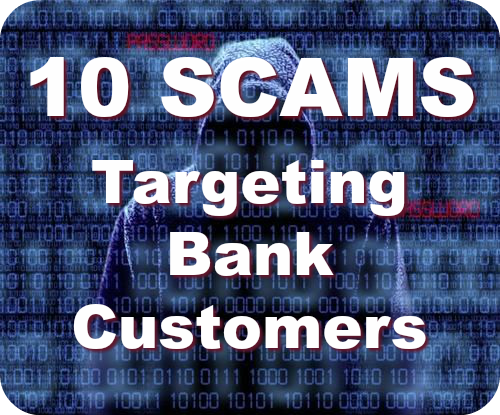 As part of that coverage, the FDIC has featured 10 scams that you should be aware of, plus key defenses to remember. Fraudulent job offers: Criminals pose online or in classified advertisements as employers or recruiters offering enticing opportunities, such as working from home. But if you’re required to pay money in advance to “help secure the job” or you must provide a great deal of personal financial information for a “background check,” those are red flags of a potential fraud.Another variation on this scam involves fake offers of part-time jobs as “mystery shoppers,” who are people paid to visit retail locations and then submit confidential reports about the experience. In an example of the fraudulent version, your job might be to receive a $500 check, go “undercover” to your bank, deposit the check into your account there, and then report back about the service provided. But you also would be instructed to immediately wire your new “employer” $500 out of your bank account to cover the check you just deposited. Days later, the bank will inform you that the check you deposited is counterfeit and you just lost $500 to thieves. One warning sign of this type of scam is that the potential employer requires you to have a bank account. Contact the FDIC’s Consumer Response Center (CRC) if you have questions about possible scams or you are the victim of a scam experiencing difficulty resolving the issue with a financial institution. The CRC answers inquiries about consumer protection laws and regulations and conducts thorough investigations of complaints about FDIC-supervised institutions. If the situation involves a financial institution for which the FDIC is not the primary federal regulator, CRC staff will refer the matter to the appropriate regulator. Visit our webpage on submitting complaints or call 1-877-ASK-FDIC (1-877-275-3342) Monday – Friday, 8am to 8pm (EST).To learn more about how to avoid financial scams, search by topic in back issues of FDIC Consumer News and the FDIC’s multimedia presentation Don’t Be an Online Victim. Also find tips from the interagency Financial Fraud Enforcement Task Force.